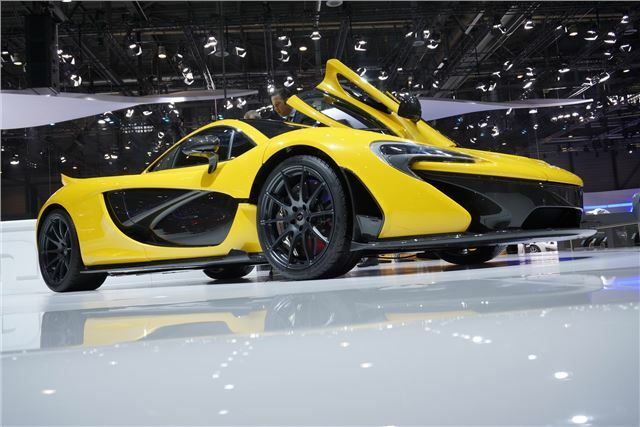 McLaren has confirmed pricing and production details of its P1 hypercar, at the full unveil at the Geneva Motor Show. The official list price will be £866,000, and 375 of the 217mph car will be built at the company's Woking factory, and it goes head-to-head with the LaFerrari. The P1 produces 916PS thanks to a combination of the 3.8-litre V8 engine fitted to the MP4-12C and an electric motor. Because it’s effectively a hybrid, it manages to emit less than 200g/km of CO2, and can run for seven miles on battery alone. A series of new images has also been revealed showing a couple of details that have changed in the transition from concept to production car. These include revised vents in in the front wings and different vents at the rear of the car. The addition of an electric motor isn’t just for increased economy and extra peak power, though – because it delivers all of its torque from zero rpm it improves acceleration from a standstill and sharpens throttle response. The motor is mounted directly on to the engine, and power from both it and the engine is channelled to the rear wheels via a seven-speed dual-clutch gearbox. Zero-emissions EV range isn't far - around six miles. It's not confirmed performance figures yet, other than 0-62mph taking 'less than three seconds', 0-124mph in 'under seven', and 0-186mph in 'less than 17 seconds'. That makes its significantly faster at accelerating than the legendary F1, although maximum speed is well down, as it's electronically limited to 217mph. We're still not sure when the first customers will get their hands on the P1, but it's on-sale, and the order books have been open for some time. Potential customers have already been wooed by McLaren at its Woking factory, including a number of high-profile 'celebrity' F1 owners.